The picture above is quite common when maintenance is neglected on an air handler. 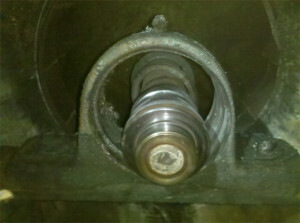 This bearing failure not only damaged the shaft but cracked the fan hub (shown above). We were able to press the shaft out of the fan and weld the fan hub all in place. While the fan was being repaired our machine shop made a new shaft. This particular job was complete in 12 hours which included dynamic balancing of the fan wheel. Needless to say, another happy Huneke client. Donna and I personally want to welcome you to our new website. Between this website, blog and Facebook, we hope to keep you informed about interesting jobs we’ve been able to help our customers resolve. We hope you check back periodically as we’re going to post unique problems we encounter everyday along with how we were involved and ultimately solved those issues. Our goal is to help you prevent similar situations in the future. We welcome your comments, or post a problem you would like us to comment on and we’ll be happy to respond.